Wall clocks are necessary accessories in many rooms, even in the age of the smartphone. Often, a quick check of the time is helpful through the day, but the phone is not the best choice because hands are busy or guests are engaged in conversation and taking out a phone to check the time is a disruption or just plain rude. A clock placed in a living room, bathroom or lobby allows the convenience of a time check with hands free for leisure activities, work or holding on to a squirming toddler. Wall clocks also make a style statement. They give a chance to finish off a room’s design whether by being tucked strategically into a collection of art or by dominating an accent wall. Since clocks can last a long time, it is important to choose a style that will look good for years or can be moved to different locations. A sleek, modern style will be more flexible than a cumbersome old-fashioned clock in many decorating schemes. In a modern or simple decorating schemes, it is necessary. 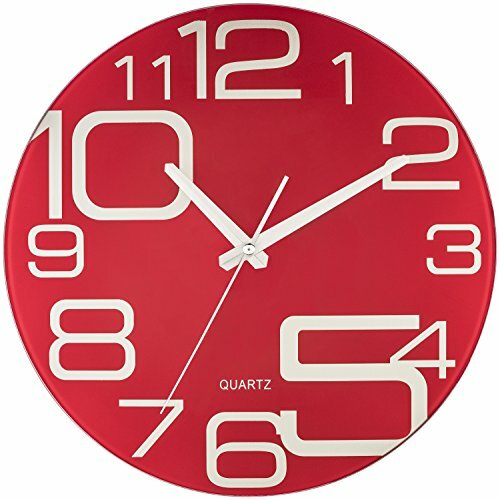 Modern clocks styles give a clean look that won’t feel fussy or dated. The size of the clock is probably the most important consideration. It should be easy to see from anywhere in the room. It should also be easy to read. Sometimes the clock face or design features are large, but the clock mechanism is so small that the clock is not practical in a large room. Also, the size of the entire clock should not overwhelm other accessories in the room unless the clock is intended as the major design piece. 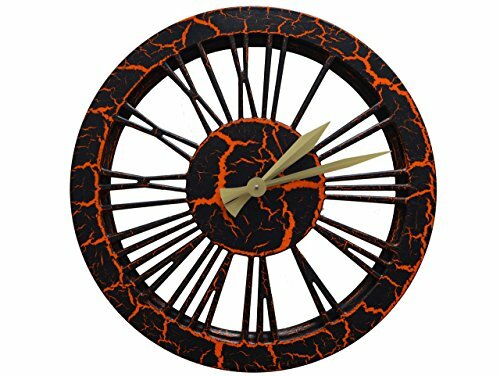 Common clock face materials include wood, metal, plastic and glass. If the clock is going to be placed in a kitchen or bathroom, choose a material that won’t be damaged by moisture (and make sure the battery housing has a cover). In direct sunlight, consider that painted wood may fade. If the clock will be hung somewhere like a hallway or stairwell where it may be bumped, a protective glass cover over the face is a feature worth having. Some find a clock that ticks audibly comforting, others find it annoying. The ticking noise can be a reminder that it is working and a comforting link to the past. The rhythmic ticking is also a great choice in a room where a baby will be napping, as many infants find rhythmic sounds soothing. In order to avoid any ticking noises, look for a model that uses a silent sweeping motion. For tight spaces, consider the depth of the clock. Because of the mechanism or design features, some clocks can come away from the wall 4 inches or more. This is probably not an issue if the clock is high over a fireplace, but may become an issue in a hallway or on a kitchen backsplash where the clock may be bumped. Additional features are available on some clocks. For an office, look for a clock with date settings, for example. Digital clocks often have options for a 24-hour display and alarm. Second hands are not always included. A clock is more likely, though not guaranteed, to make some ticking sound if it includes a second hand. One common failure with wall clocks is that the hands get damaged. They are often made of a light material and may bend or break when handled or if the clock falls. Hands can usually be replaced, though, by purchasing another set at a craft store and adjusting with the center nut or screw. If the clock has complex setting instructions, consider attaching the manual or instruction page to the back of the clock. Follow manufacturer’s recommendations about installation. Some clocks can be quite heavy and not all mechanisms or components are built to take a fall. The clocks generally come with built-in hanging devices but may also have special instructions to accommodate the clock’s weight or design. Wall clocks generally take batteries in order to eliminate unattractive cords. Most will take one or two AA or AAA batteries, but some need watch batteries or other options. Keep extra batteries on hand. In the list below, only those that take unusual options will be mentioned. These 11 clocks caught our attention for their artistry, quality materials, versatility and modern style. 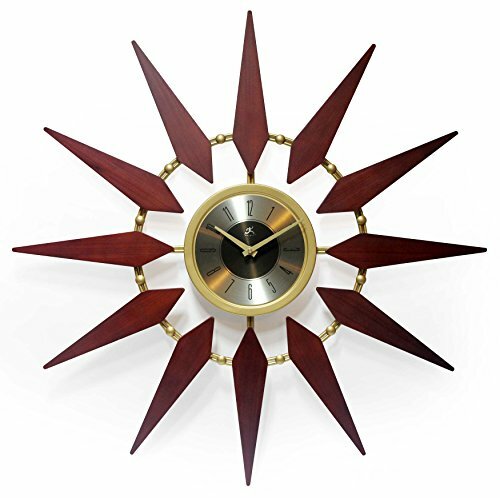 This 30-inch clock from Infinity Instruments will make a striking statement. The starburst design is a classic of the mid-century modern style and will blend into a 1950s or ’60s decor. The metal frame is open so the large clock still has a light feel. Every one of these wood clocks is handmade for a unique look and painted with non-toxic paint. Four color combinations are available including a neutral wood finish and a bright blue, red, or orange and black, which would provide a great pop of color, perhaps representing team colors. The German Hermle clock movement, one of the traditional Black Forest clock-making companies, promises accuracy and durability. 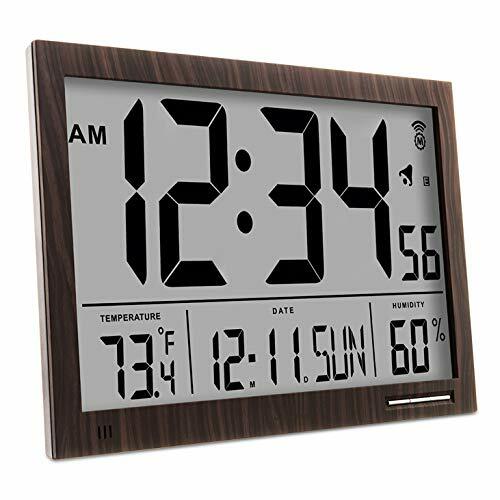 For those needing more from a wall clock than just the time, the 9-by-14.5-inch display of the Marathon Digital clock should have it. The clock shows the date, temperature, humidity, and also includes an alarm with snooze. Many settings can be adjusted to match preferences, like a 24-hour display. The clock sets itself with radio waves and is available in multiple trim finishes. 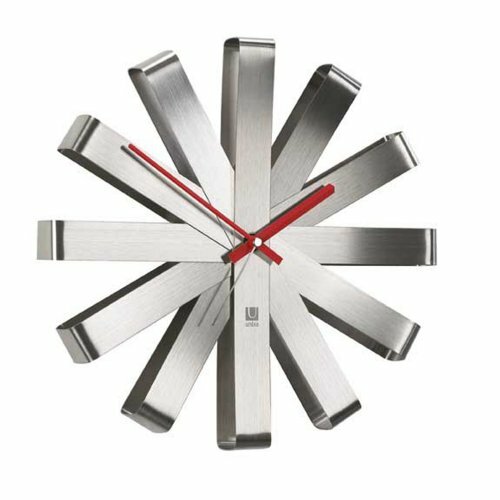 A fresh contemporary design defines this diamond aluminum clock. 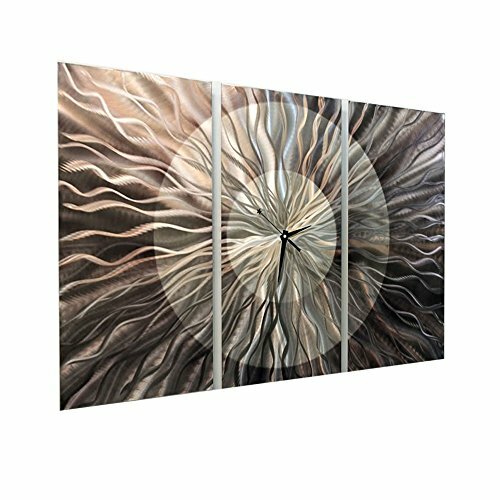 The aluminum background is textured to catch and reflect light as it changes through the day. It is 17 inches at its widest points, vertically and horizontally. It is available in four color combinations: a solid silver, or silver with red, black or blue accents. Each piece is signed by artist Jon Allen and comes with a certificate of authenticity. Made of bent steel, this clock from Umbra offers function in a minimalist style. 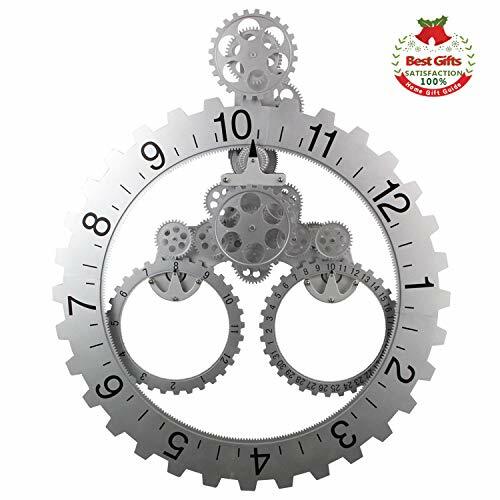 The hours are represented by broad metal spokes in stainless steel, black or a copper tone. With a 12-inch diameter, this clock will fit comfortably in several spaces. Includes a second hand that audibly ticks off the seconds, which provides an old-fashioned feel or useful time-keeping tool. 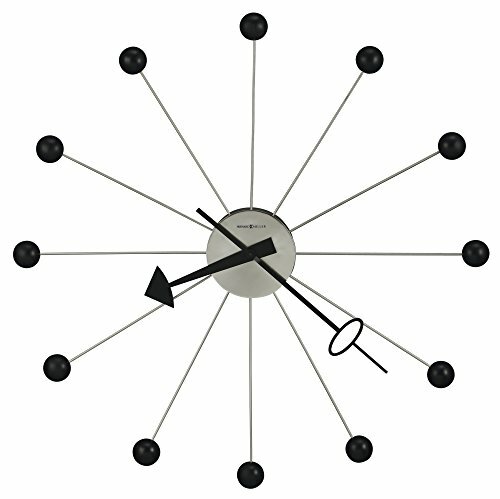 This fun pin wheel clock was inspired by mid-century modern designer George Nelson. The 12.9-inch diameter design features wood balls in multiple retro colors like teal, orange and powder blue. The hands have space-age shapes around a zinc alloy base. The clock mechanism is designed to be silent. 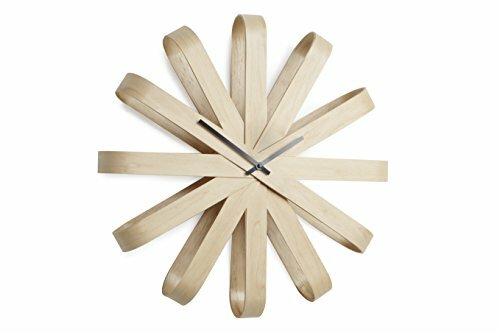 Natural beech curves feature in the Umbra Ribbonwood clock. With a 20.25-inch diameter and airy curves, this clock has a presence but does not overwhelm a space. The time-keeping mechanism uses a sweeping motion that is silent and smooth. The variety of silver mirrored numbers is the key feature of this reinforced glass clock. Placed on a bright red background, the numbers vary in size and proportion. The 12-inch clock also includes a second hand and quiet operation. With a 42-inch diameter, this black satin and nickel finish ball clock makes a dramatic statement. 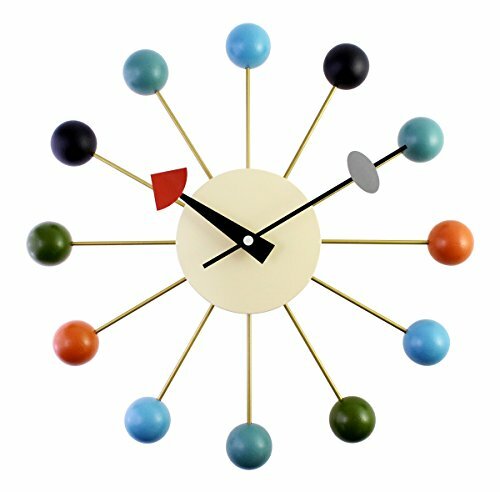 Based on a 1940s design from artist George Nelson, the ball clock is a highlight of mid-century modern style. The large size will make it the centerpiece of a living room accent wall or office area. 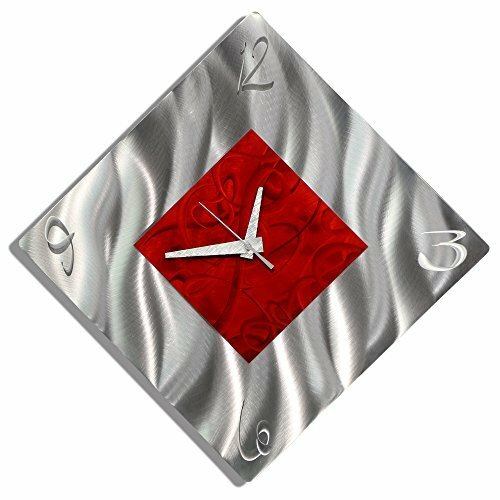 Three panels of etched aircraft-grade aluminum make up this clock and artwork. The pieces are designed to reflect light in different colors. All three pieces together measure 38-by-24-inches, which is a size designed to make a statement over a fireplace or as part of an office arrangement. Artist Jon Allen signs each piece and includes a certificate of authenticity. The pieces have a custom-designed mounting mechanism with easy-to-follow instructions. With the appearance of multiple large gears, this clock has a unique way of showing not only the time but also the date. Available in both silver and black, this clock measures 26-by-22-inches so it is easily visible and makes a strong statement. It requires two D batteries. The dials for the date may have to be reset each month, so it will be important to keep the instructions near to hand.